The Malegaon blast case in which Lt Col Purohit was made an accused took several turns. On Monday in a major relief to Purohit, the Supreme Court granted him bail. He will walk out of jail today after spending nearly 9 years. The arrests of Sadhvi Pragya Singh Thakur and Lt. Col Shrikant Purohit had made headlines several years back. 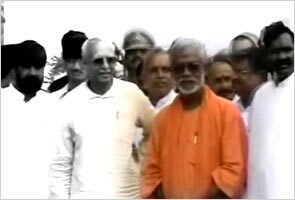 Both these people were arrested in connection with the Malegaon blasts of 2008. While Sadhvi Pragya Singh Thakur had maintained that she was framed, Lt Col Purohit has made it clear that he was trying to infiltrate into a militant organization but the police went on to charge him with terrorism. The bail plea filed by Sadhvi Pragya Singh will be heard on December 14th by the Bombay High Court. The matter has been listed to be heard at 3 PM. Malegaon blasts which also carried out the Samjautha blasts. man in this particular case. Author Vicky NanjappaPosted on December 22, 2010 December 23, 2010 Categories TerrorismTags Col Purohit, Daynand Pandey, Lashkar-e-Tayiba, NIA, Sadhvi Pragy Singh Thakur, Samjhuata blasts, Swami Aseemnand, Vicky Nanjappa23 Comments on Is Aseemanand the man?